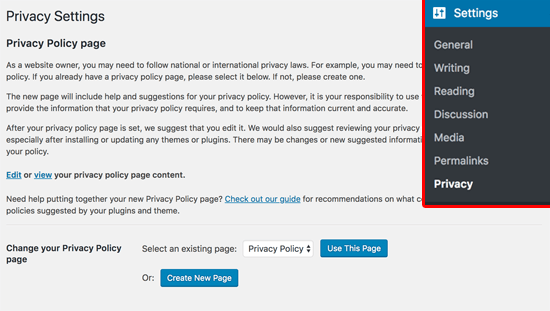 Are you confused by GDPR, and how it will impact your WordPress site? GDPR, short for General Data Protection Regulation, is an European Union law that you have likely heard about. 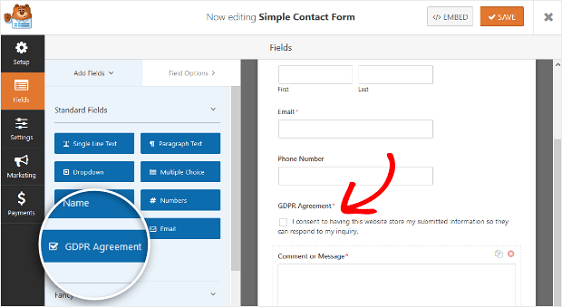 We have received dozens of emails from users asking us to explain GDPR in plain English and share tips on how to make your website GDPR compliant. In this email/article, we will explain everything you need to know about GDPR (without the complex legal stuff). Disclaimer: We are digital marketers, not lawyers. Nothing on we write should ever be considered legal advice. 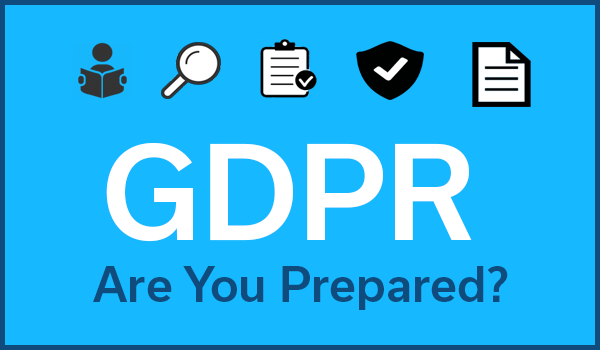 The General Data Protection Regulation (GDPR) is a European Union (EU) law that took place on May 25, 2018. The goal of GDPR is to give EU citizens control over their personal data and change the data privacy approach of organizations across the world. Basically after May 25, 2018, businesses that are not in compliance with GDPR’s requirement can face large fines up to 4% of a company’s annual global revenue OR €20 million (whichever is greater). This is enough reason to cause wide-spread panic among businesses around the world. While GDPR has the potential to escalate to those high levels of fines, it will start with a warning, then a reprimand, then a suspension of data processing, and if you continue to violate the law, then the large fines will hit. The maximum fine part in our opinion is largely to get the attention of large companies like Facebook and Google, so this regulation is NOT ignored. Furthermore, this encourages companies to actually put more emphasis on protecting the rights of people. Explicit Consent – if you’re collecting personal data from an EU resident, then you must obtain explicit consent that’s specific and unambiguous. In other words, you can’t just send unsolicited emails to people who gave you their business card or filled out your website contact form because they DID NOT opt-in for your marketing newsletter (that’s called SPAM by the way, and you shouldn’t be doing that anyway). 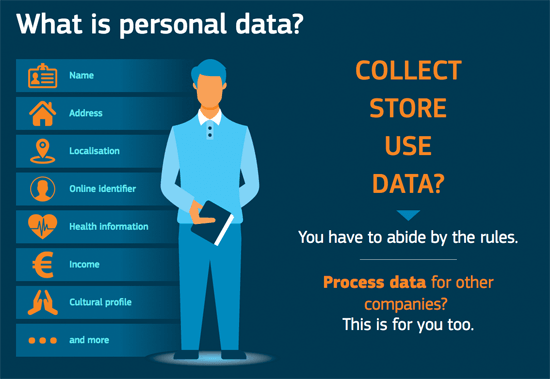 Rights to Data – you must inform individuals where, why, and how their data is processed / stored. Individuals have the right to download their personal data and they also have the right to be forgotten, meaning they can ask for their data to be deleted. This will make sure that when you hit Unsubscribe or ask companies to delete your profile, then they actually do that (hmm, go figure). I’m looking at YOU, Zenefits, still waiting for my account to be deleted for 2 years, and hoping that you stop sending me spam emails just because I made the mistake of trying out your service. Data Protection Officers – if you are a public company or process large amounts of personal information, then you must appoint a data protection officer. Again, this is not required for small businesses. Consult an attorney if you’re in doubt. To put it in plain English, GDPR makes sure that businesses can’t go around spamming people by sending emails they didn’t ask for. Businesses can’t sell people’s data without their explicit consent (good luck getting this consent). 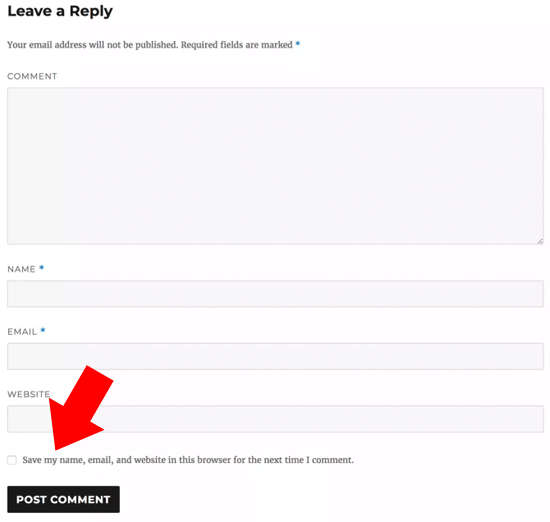 Businesses have to delete user’s account and unsubscribe them from email lists if the user ask you to do that. Businesses have to report data breaches and overall be better about data protection. 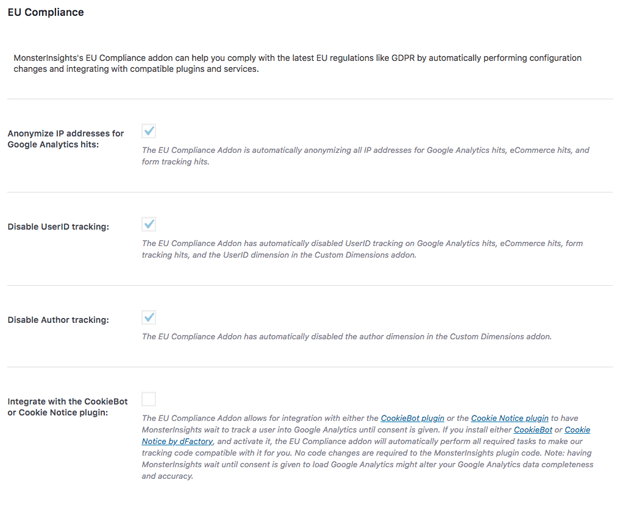 Ok so now you are probably wondering what do you need to do to make sure that your website is GDPR compliant. Ok so you might be thinking what does this mean in plain english? These three things are enough to make a default WordPress blog GDPR compliant. However it is very likely that your website has additional features that will also need to be in compliance. If your website is running retargeting pixels or retargeting ads, then you will need to get user’s consent. This can be accomplished by using a plugin like Cookie Notice. 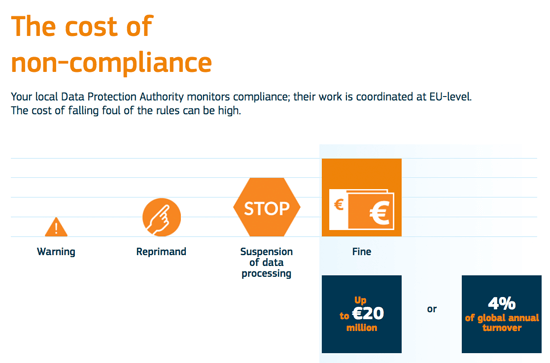 The likelihood of you getting a fine the day after this rule goes in effect are pretty close to zero because the European Union’s website states that first you’ll get a warning, then a reprimand, and fines are the last step if you fail to comply and knowingly ignore the law. The EU is not out to get you. It’s doing this to protect users’ data and restore people’s trust in online businesses. As the world goes digital, we need these standards. With the recent data breaches of large companies, it’s important that these standards are adapted globally. If you liked this article, then please find us on Twitter and Facebook.